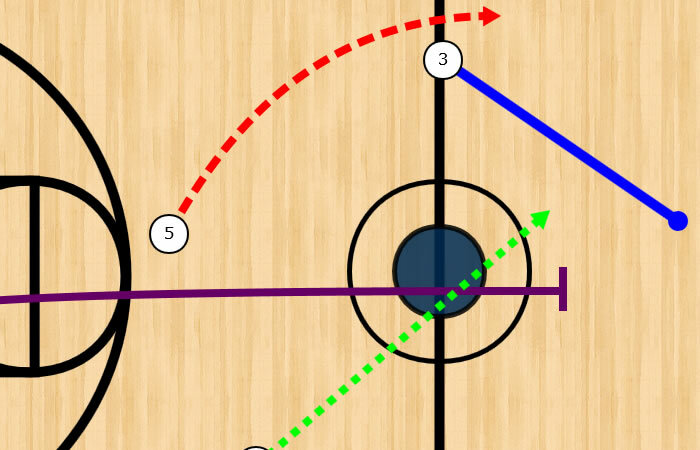 Basketball Playbook Designer - Create and Draw your own basketball plays and playbooks in minutes. 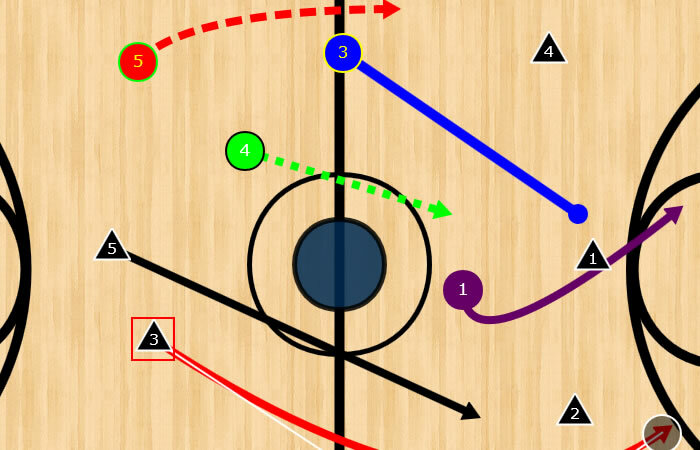 Create A Basketball Playbook and Draw Plays for Free using CoachYouths Playbook Design Software. Get Started Today: It is FREE to signup and get started, no credit card required. Draw and Manage Your Playbooks with ease. Our basketball playbook design application offers a truly ONE-OF-A-KIND experience that no other product can offer. Built from the ground up to be simple, yet very powerful. You can draw BOTH half-court and full-court plays within the same playbook. All you need is a modern device with a modern web browser and an internet connection. Creating your own basketball playbook and drawing basketball plays has never been easier, if you can move a mouse you can start drawing plays using our Basketball Playbook Designer. With our playbook design application you can work anywhere and on any device that has an internet connection. No software install required, so if you have a computer with a modern browser and internet you can start drawing plays. You can share your playbooks with your entire team. Share with your players and parents. You can also grant access to the rest of your coaching staff so they can create and edit playbooks as well. 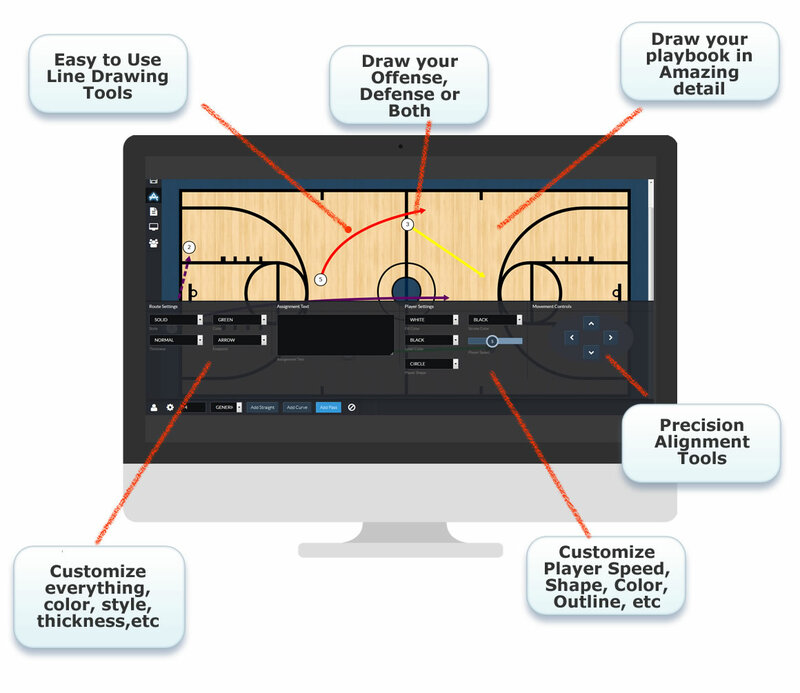 CoachYouths Basketball Playbook Designer is 100% web-based, NO SOFTWARE TO INSTALL. Your playbooks are stored on multiple servers "in the cloud" not on your machine. Never lose your work to a computer crash again. CoachYouths Basketball Playbook Designer is by far the most modern and easy to use playbook design software available. 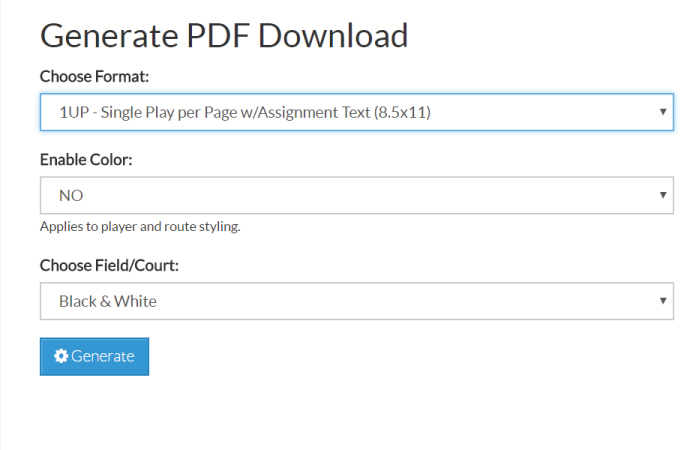 What is inside Basketball Playbook Designer? Our route drawing tools are not only easy to use, but also allow for complete customization. You can choose the color, draw solid, dashed or dotted lines and choose the thickness of each line. You can also customize the route endpoint with shapes such as arrows, circles, square and also a tee. You can change everything about your players when drawing plays with CoachYouths Basketball Playbook Designer. Choose any color scheme or stick with the default black and white. You can also change the player's label, animation speed and position type. You can set delays during animation and show any passes, so that the timing is perfect. You can provide more than just a drawing, you can provide detailed assignment text to your players to help them better grasp the playbook. Every situation is different, so every playbook should be customizable. 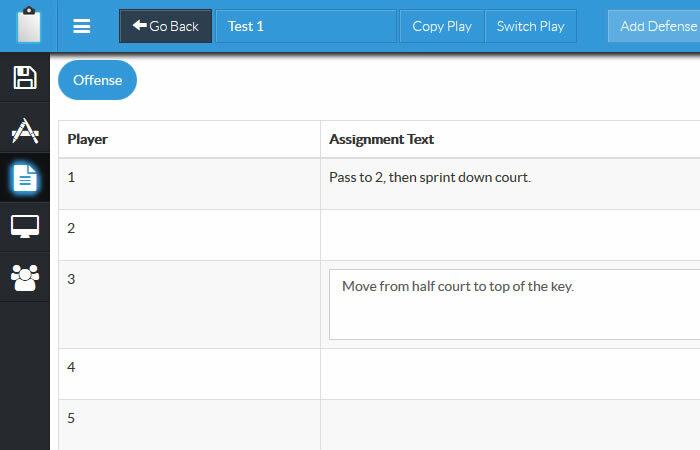 You can create playbooks with as few as 3 players all the way up to 6 players. 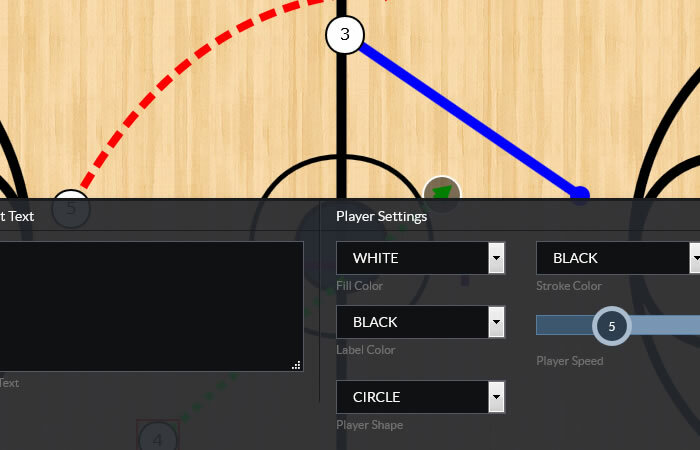 This allows coaches of any basketball team to use our playbook design application, for any league or pick up games. Sometimes you just need a paper copy of your playbook, no problem you can download a PDF of your playbook and print it at any time. We also allow you to download JPEG images of your entire playbook, useful for embedding elsewhere such as WORD or PowerPoint. You can also download and print number play lists of your playbook and player wristbands in a variety of formats and sizes. Your playbooks will be safe and secure in the "cloud" on our servers, not only are your playbooks stored on multiple machines, we also perform nightly backups of all your data. Never lose your hard work to a computer failure again, draw your playbooks once and you will have them forever. If you run into trouble, we are here to help. We offer both live chat support as well as email support within 24 hours (often within a few minutes). In addition we offer a full library of self-help articles to guide you thru every feature of our application, but if you need further help we are always here. We offer video tutorials covering every feature of CoachYouths playbook designer, if your not sure about something these videos are the best place to start. Anytime we add new features, improve existing features or fix bugs you get the update automatically next time you login. No extra charges for the most recent update, nothing to install, nothing for you to do or worry about, its automatic. 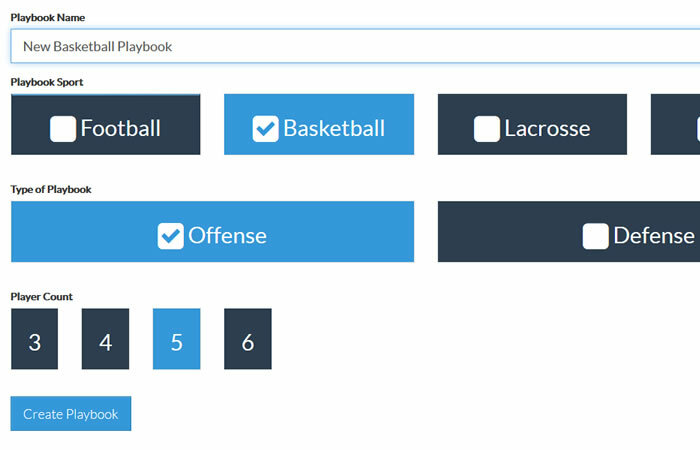 Our playbook design app also includes support for other sports, such as football, soccer and lacrosse, we also have additional coaching apps planned. By subscribing to CoachYouths you will also get access to these apps, so if you coach multiple sports year around you get these extra apps included in your plan. If you don't see the answer to your question, please contact us, we would love to chat with you. Can I really signup for FREE? YES, we are so confident in the quality of our product that we allow you to signup and start using our Football Playbook Designer for FREE. There are no restrictions to your free trial and you will have a full 7 days to give it a test drive, with no obligation to ever become a paid member. **As of 07/25/2014 trial users will no longer have access to download PDFs for printing, the PDF generation is very resource intensive and we need to save these resources for paid members. How do I continue AFTER my free trial period? If you would like to continue using our application all you will need to do is save a credit card for payment to your account, nothing else is required, there will be no changes to your playbooks, teams or anything else. So there is nothing to install? What is the "cloud"? That's right there is NOTHING to install, our playbook creator is 100% web-based, nothing is installed on your local machine. The cloud is a concept in which your data and/or software applications reside on servers around the world, NOT on your local machine, this allows you to access your playbooks from any modern device with an internet connection. This means you can access from your laptop at home, on the road, your desktop at work or even at your hotel lobby, wherever you are, you can access your account. There are NO limits to the number playbooks or teams you can create. When you signup you can choose a Plan, even during your free trial. The plan you choose will determine the limit on the number coaches with whom you can share your account with. So if you have 2 other coaches on your team you would need the 3 coach plan, if its just you then you only need the single coach plan, we have plans from 1 to 10 coaches. Can I use this on more than 1 computer or device? YES, this is a web based application, no software has to be installed on any device, so you are free to login and draw playbooks from an modern device with an internet connection. Is this a Windows only application? 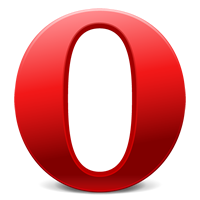 NO, you are able to use any device that has a modern web browser, so you can use it on a tablet, laptop, or desktop running Windows, Mac OSx, Android, even Linux. Can I use this on my Phone? The short answer is MAYBE, it will depend on how new the phone is, if you have a supported browser and if the screen size is big enough, if the screen size is too small you will have a hard time using it to draw plays. We recommend a tablet instead. 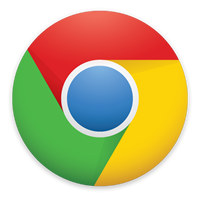 What is considered a modern Web Browser? 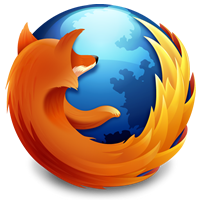 For Internet Explorer you must have 11+, otherwise a version of Firefox, Chrome, Opera or Safari that is not more than a year old will be fine. 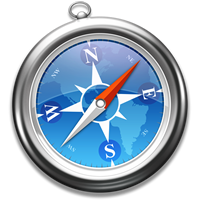 If you have an old browser you really should update it, all of the popular browsers are free to update. 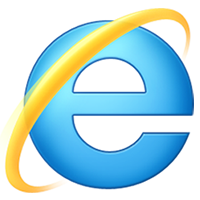 To use IE (Internet Explorer) you must have version 11.0 or newer.